A flea can be the most unwanted house guest in your canine's habitat. A single flea can jump repeatedly and in doing so can cover the span of a football field in search of your dog, a suitable host. In warmer climates, there may be no break from a flea infestation. Spotting the signs of fleas on your dog, and taking quick action can keep a single flea from creating an infestation. A single flea left to its own devices can create a huge infestation. Your dog may exhibit behaviors that are telltale signs of fleas. Agitated or restless behavior accompanied by scratching, may be indicators that fleas have taken up residence on your dog. 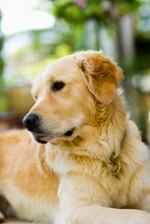 As the infestation grows, your dog may begin biting at himself, and he may whine as fleas dine on his unprotected skin. In the case of a minor infestation, you may be unable to see fleas on your dog's body. Check his armpits and his tail area where fleas normally gather. Run a flea comb through his fur to check for live fleas, and flea dirt, which is dried blood. In a more serious infestation, the appearance of hot spots, which are red and bloody sores, may occur. A bath can serve several purposes if you suspect your dog has fleas. The appearance of fleas in your dog's bath water can confirm their presence on his body. Additionally, using a mild dish soap as a shampoo will kill the fleas on your dog's body, and the bath can help soothe your dog's inflamed skin. A check of your dog's environment may help you deduce whether or not fleas have paid him a visit. If you notice live fleas or flea dirt in your dog's bedding, you have your answer. While wearing white socks, take a walk through the areas your dog frequents. The white will attract the fleas if they're present in the area. Setting a flea light trap, which is a bowl of soapy water placed beneath a desk lamp or night light, can help you determine if fleas are present. Set it at night. If there are fleas in the bowl in the morning, there are surely more lurking in your home or on your dog. If you suspect, or have confirmed that your dog has fleas, a trip to the veterinarian is in order. Your vet can confirm the presence of fleas, and a fast-acting tablet can kill the fleas that are present on your dog's body at the time of the visit. Your veterinarian can examine your dog and determine which long-term preventive can help you manage the flea population in your home. Your vet also may recommend treatment for your dog's environment, to help manage the fleas that stayed behind while you and your dog were visiting his veterinarian.